Xen is a CSS-based, lightweight commercial theme for Joomla! 1.0.x from toolbox:creations. 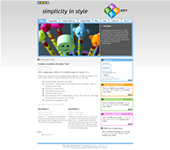 Some of the features include, four dynamically selectable colour styles, three widths - wide (1000px), normal (900px) and thin (800px), five built-in module styles, collapsible "Showcase" & Right column, colour-dependant built in styled elements and much more. You can see a live demo, get more information or straight away go and buy this new theme by clicking here.